Bones are connected to each other to form the human skeleton - the framework of living tissue that grows, repairs, and renews itself. Under the right conditions, bone tissue undergoes a process of mineralization, formed by collagen matrix and hardened by deposited calcium. Bone tissue (osseous tissue) differs greatly from other tissues in the body. Bone is hard and many of its functions depend on that characteristic hardness. 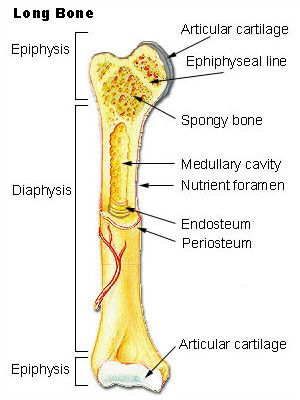 A long bone has two parts: the diaphysis and the epiphysis. The diaphysis is the tubular shaft that runs between the proximal and distal ends of the bone. The hollow region in the diaphysis is called the medullary cavity, which is filled with yellow marrow. The walls of the diaphysis are composed of dense and hard compact bone. Two types of bone tissue are present - Compact/cortical bone and cancellous/spongy bone. Compact/cortical bone - Makes up outer part of bone. Rigid, dense, highly organised bone tissue, arranged in haversian systems which are microscopic cylinders of bone matrix with osteocytes in concentric rings around central haversian canals. 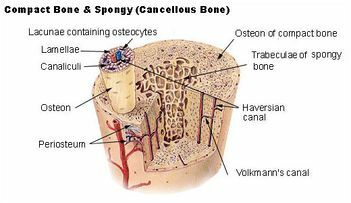 Cancellous/spongy bone - Makes up inner part of bone. More elastic and porous, storage of red bone marrow. Osteocytes, matrix and blood vessels are not arranged in haversian systems. Approximately 20% of in vivo bone is water. Of the dry bone mass, 60-70% of is bone mineral in the form of small crystals and the rest is collagen. The composition of the mineral component is hydroxyapatite Ca10(PO4)6(OH)2 and collagen is the main fibrous protein of the human body. To allow bone to ordinarily adjust strength in proportion to the degree of bone stress. When subjected to heavy loads, bones will consequently thicken. To rearrange shape of bone for proper support of mechanical forces in accordance with stress patterns. To replace old bone which may be brittle/weak in order to maintain toughness of bone. New organic matrix is needed as the old organic matrix degenerates. The osteoclasts function to remove fragments of dead or damaged bone by dissolving and reabsorbing calcium salts of bone matrix. Like a building that has just collapsed, the rubble must be removed before reconstruction can take place. Osteoblasts are activated to knit the broken ends of bone together. ↑ Hall JE. Guyton and Hall textbook of medical physiology e-Book. Elsevier Health Sciences; 2015 May 31.